The Sanyo Camcoder VPC-CA9 instruction manual is available in pdf format. For owner of this camcoder, you can get link download the manual here. There are important information of this manual for example about setup, setting guide and troubleshooting checklist. 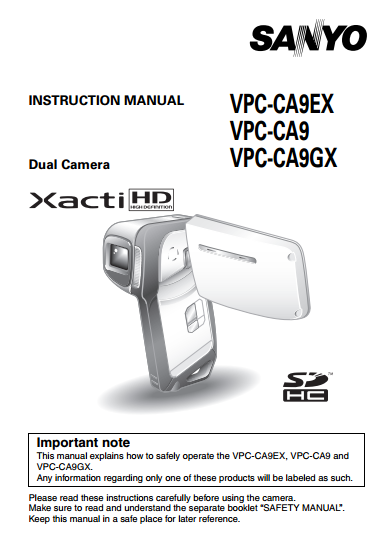 The Sanyo Camcoder VPC-CA9 user manual consist of 170 pages and support in english language. It's contains reference information such as tutorial How to use the accessories, camcoder part overview, Recharging the battery pack, Install the battery pack, Installing the DC adaptor, Install the card, Turning on the camera, Switching between the SIMPLE and NORMAL modes, Using the autofocus, Using the flash, How to save one frame from a video clip as a still image. Then about shooting guide like recording menu, Self-timer setting, filter setting, Video stabilizer setting, Slideshow settings, File protect setting, Editing video clips, Printing instructions, Setting up the shortcuts, TV output setting, Connecting to a standard video input terminal, Connect to the 480p/720p terminal, commonly asked questions and troubleshooting. Why doesn’t the power turn on? Why is the battery pack consumed so quickly even after it was fully recharged? Why does the icon appear? Why does the multi-indicator flash red? Why doesn’t the flash operate? Are the settings retained even after the camera is turned off? Which resolution setting should I use? What is the difference between the digital zoom and the optical zoom? How can I get the distant view into focus? When used in cold weather, why does the image seem to leave traces as it moves? Why does the images displayed image contain some red, blue and green dots, or why are black spots visible? Why is the image too bright? Why is the image out of focus? Why is a part of the image missing? Why is there no image (? is shown)? Why is the playback image distorted? Why isn’t the magnified image clear? Why isn’t the captured image clear? Can I play back image and sound files that I edited using my computer? Why is there a motor-like sound during video clip playback? Why does a message appear during PictBridge printing? The “Cannot edit video clips with unlike settings” message appears. Why is a noise heard from a nearby TV or radio during battery recharging? Why does the “Insufficient memory remaining” message appear? Why does the “Card is protected” message appear? Why can’t the camera be operated? Can I use my camera abroad? Why does the “System error” message appear? A blinking temperature warning icon \ is shown, and the camera does not turn on. An image is not captured when the [ ] button or [ ] button is pressed. The flash does not operate. The digital zoom does not work. When zooming in or out, the zoom movement stops momentarily. There is noise in the captured image. The \ icon appears, and shooting is not possible. The colors of the images captured indoors are not correct. The battery pack is not charging.The “Image is protected” message appears and the file cannot be deleted. The recording capacity is less than the value specified for the card Normal change occurring with battery use. Even with normal correct use of the lithium-ion battery, it has a tendency to swell as the number of charge and discharge cycles adds up and it gradually approaches the end of its service life. The battery pack appears to be swollen.